All of this appears intended to support the Government’s current proposals for making “uninterrupted” WiFi and Mobile (5G) broadband speeds of up to 1Gbps (Gigabits per second) available on-board all UK mainline train routes by 2025. This would be a useful improvement over the current situation, where patchy connectivity and slow speeds are still common on a lot of routes. 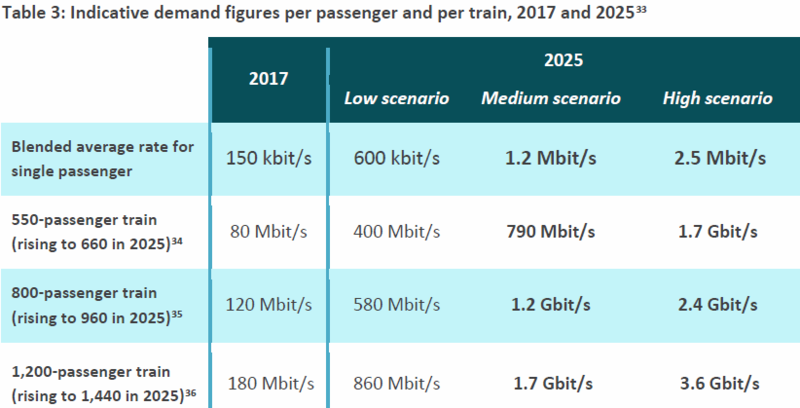 Ofcom’s advice uses an average ‘per passenger’ demand of 150Kbps (0.15Mbps) to reflect current (2017) “unconstrained” demand, which they say means that a 550-passenger train today may need to be fuelled by 80Mbps of capacity, before rising to 120Mbps for 800 passengers and 180Mbps for 1,200 passengers. “We consider that, at these rates, passengers’ experience during the journey would be similar to the level of service they currently receive when using their mobile phone in a well-served area over a 4G network connection,” said the regulator. Demand is of course always rising and by 2025 such trains will need significantly more capacity. “Our assessment is that a pragmatic approach to thinking about demand post-2025, i.e. in the mid-late 2020s, would be to focus more on the medium and high scenarios. On this basis, a plausible view of future requirements is that, in very broad terms, a busy mainline train might need in the region of 1 Gbit/s, and a crowded commuter train between 2-3 Gbit/s, when looking over a ten-year time horizon. We note however that demand figures would be significantly lower if passengers were charged for the on-board Wi-Fi service,” said Ofcom. Ofcom added that the figure of 1Gbps for a busy mainline train is equivalent to an average data requirement per passenger of around 1.5Mbps in the mid-late 2020s, representing a ten-fold increase in average data consumption per passenger compared to 2017. The regulator assumes that not everybody will be using their mobile devices at the same time, but they predict that the maximum percentage of passengers using their mobile devices at the same time will increase from 45% in 2017 to 65% in 2025. Many of those will also be making use of much more data-hungry applications (higher definition video streaming etc.). Ofcom appears to rule out many of today’s existing mobile friendly spectrum bands (i.e. 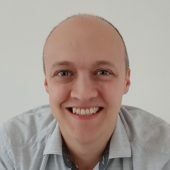 those below 6GHz), which can cope with current requirements but “none have the realistic capability to meet our demand scenarios for the mid-late 2020s for busy trains and busy parts of the rail network.” In other words, sub-6GHz bands are not “credible candidates” for tackling future needs. Instead the regulator points the finger at mmWave bands in the range of 24-27GHz, which the next generation of 5G technology is expected to use for delivering fixed wireless connections to homes and businesses. But with the right track-side infrastructure it could also be used to feed trains. Based on the above assessment, we believe the 26GHz band likely offers the best prospects for track-to-train connectivity solutions that meet our demand scenarios for the mid-late 2020s. This is due to its combination of high bandwidth, more straightforward coexistence environment (for the upper part of 26 GHz in particular), large potential equipment ecosystem and comparatively modest opportunity cost in the rail connectivity application. Ofcom also points toward the possibility of harnessing the 66-71GHz band or some already licensed spectrum at 28GHz. However the regulator notes that it has not yet come to any decision on whether the spectrum bands identified should be used for the purposes of enabling track-to-train connectivity, or whether certain entities should be authorised for providing these services. The Government and Ofcom clearly still have a lot of work left to do. Pressuming we get the Brexit we voted for then it shouldnt be more than 200Mbps by 2025. Ofcom seem to have ducked the key issue of how 26GHz is going to penetrate trains when existing frequencies (With better penetration characteristics) often struggle. Easy, it doesn’t have to. We’re talking about the capacity side here, not necessarily how the service is distributed inside the train itself (that will use more normal bands and WiFi). So you have your kit positioned on the outside of the train to get the signal. Exact same principle as Fixed Wireless Broadband uses today Antenna is outside of train and then uses WiFi inside for commuters to use. 1.7Gbps to 3.6Gbps per train? How many trains are there in the UK? Would be interesting to know what capacity we might need in the future just to deliver enough capacity to autonomous cars! 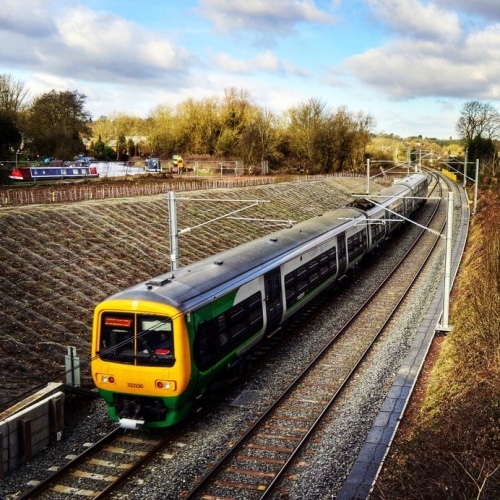 Nice picture of a Class 323 on the Alvechurch loop. Connecting on trains I don’t use the wifi but either EE or 3 – principally data via 3. There is no more difficulty getting their signals inside a carriage than there is in a car. 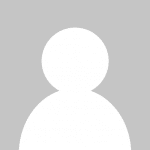 but also that distrusting the security I severely minimise doing anything on Wifi anywhere. I think some of the on train Wifi is or was satellite – with the obvious problems: cost & latency. Recent developments mean browsers have taken to testing if Wifi is secure and commonly some question is raised. I much remarked that this should happen exactly where information on contracts involving 100s of millions of millions of pounds would be about. Wifi might well be made better to use but I think anyone concerned with common sense security will have set it up on a mobile. To attract people out of cars, or from aircraft, to trains they should be able to use their mobiles just as they normally, naturally, and instinctively do – especially the peak time, long distance passengers who might buy the expensive tickets.